Long time rose growers know to make sure their garden soil is in optimal condition in order to get the best rose growing results. Our compost extract for roses helps boost rose bush growth, bud count and bloom longevity by adding a broad range of micro nutrients, trace minerals and bioavailable potash to the soil. We also add kelp and humic acid to encourage soil microbial activity and enhance nutrient uptake. Our rose growing formula has been used for years by professional rose and flower growers, competitive rose growers and hobbyists to make sure they get top performance from their roses. One quart of this natural compost extract will make eight gallons, or 64 one pint doses. Combine with water at the rate of one half ounce of product to one pint of water. Apply to soil around rose bush every other week after pruning period and through growing season. 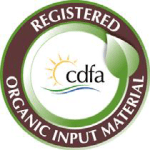 Provides ingredients missing from popular fertilizers. Longer bloom cycles and longer shelf life in displays. 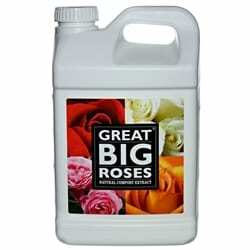 Why do I need Great Big Roses Natural Compost Extract? Rose bushes are heavy feeders. 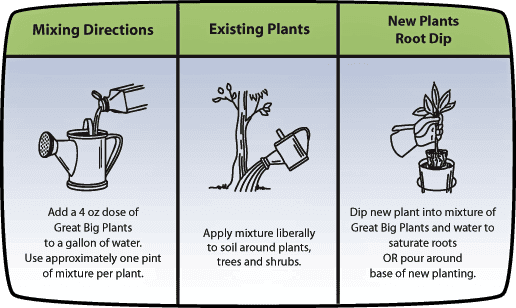 Yet, new rose bush plantings are often placed in soil that is severely lacking in beneficial microbes, micronutrients and bioavailable carbon. This significantly reduces the root ball’s ability to absorb nutrients and makes the soil more susceptible to disease. 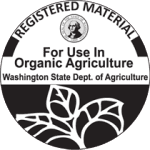 Our natural compost extract inoculates your soil with beneficial microbes and bioavailable carbon and micronutrients in the root zone for immediate plant benefit. Use our natural compost extract to minimize transplant shock, growth lag time and new plant mortality. 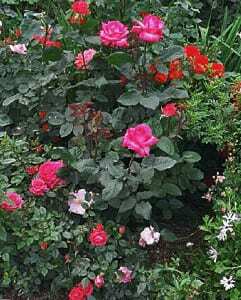 Mature rose bushes continuously consume the soil’s supply of nutrients and micronutrients. Untreated, this not only creates a deficiency that degrades plant health, but also upsets the soil ecology leading to poor water retention, fertilizer leaching, declining fertilizer uptake and increased disease pressure. 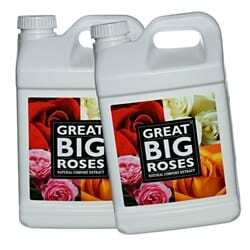 Apply regular doses of Great Big Roses Natural Compost Extract to replenish your soil to ensure new growth, blossoming and hardiness. 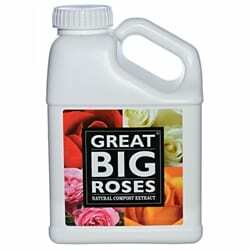 Great Big Roses Natural Compost Extract is designed to improve the soil where it matters most – in the plant’s root zone. It flows to the root zone upon application where it establishes and/or replenishes the population of beneficial microorganisms, provides trace amounts of major nutrients, dozens of micronutrients and minerals, and provides carbon (in the form of humic acid) as a food source to new and existing microorganisms. Humic acid also helps the rose bush uptake micronutrients and improves the soil’s carbon to nitrogen ratio, thereby helping the bush to uptake nitrogen. Kelp is known to be a microbe food and a source of micronutrients and is believed to be a source of plant growth hormones such as gibberellins, cytokinins and auxins which help trigger more frequent and numerous rose buds. 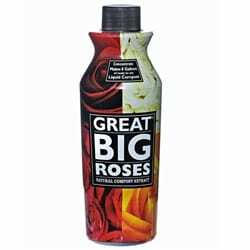 Combine our Great Big Roses Natural Compost Extract with water at the rate of one ounce of concentrate per quart of water. Use one pint of mixture per medium sized plant. Drench the soil around the base of the plant or use as a root dip for new plantings. (see below) After the initial drenching or root dip it is best to apply our Natural Compost Extract twice a month during the growing season and monthly thereafter. One quart will make 8 gallons of ready-to-use liquid compost, equal to 64 pint-sized doses. Use less on small bushes and more on large bushes. It is okay to add traditional N-P-K fertilizer to the soil at the same time, but we recommend using a little less than usual.